My name is Meira K, and I am a Shorecrest eighth grader. 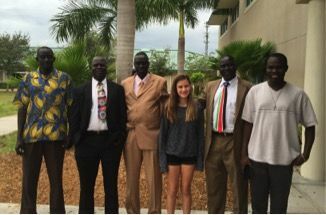 I recently did my history project about the Lost Boys of Sudan, and I was fortunate enough to meet Joseph Deng. Joseph was a Lost Boy himself, and he now lives in New Port Richey, Florida. He has started his own organization that brings medical supplies to those in need in Southern Sudan. He makes the trip once each year and stays there for a month at a time. His story has inspired me, so I have decided to hold a medicine drive here at Shorecrest. The drive will last from February 8-April 1. I am collecting only unopened, Over-the-Counter medicine, and your donation will save lives. Collection bins will be in both Middle School buildings. One bottle of Imodium saves five lives in South Sudan. Please help this cause so that thousands of people can live another day. Thank you. Anything else helps as well. Thank you! For More Information or questions, please contact me at mekowalski@shorecrest.org.